Lathes and routers should train people in the next wave of manufacturing skills. It's finally happened. 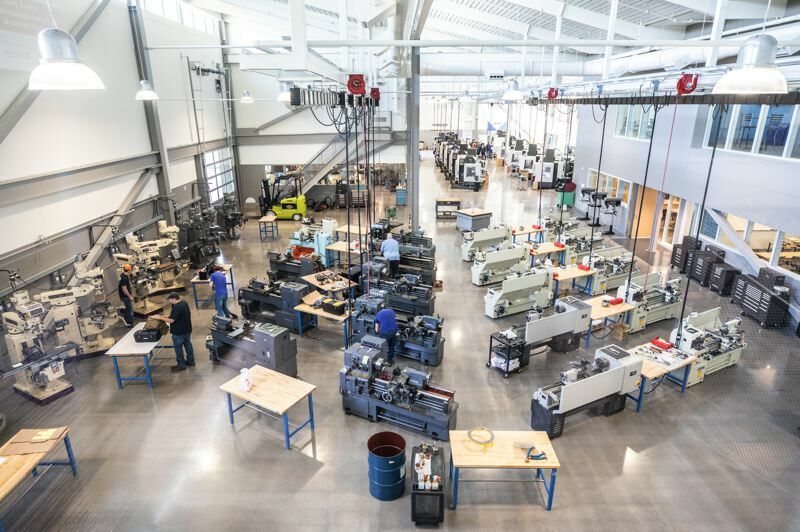 Clackamas Community College has opened its Industrial Technology Center, a gleaming, light-filled collection of workshops and classrooms. 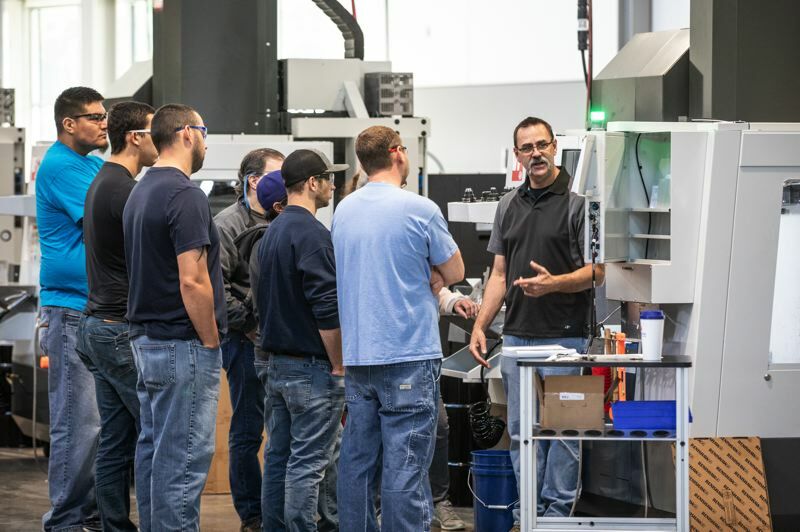 The ITC on the Oregon City campus embodies what teachers have been saying for a decade: that manufacturing is now a clean, safe, skilled job that might put you on a par, wages-wise, with your baby boomer grandparents. 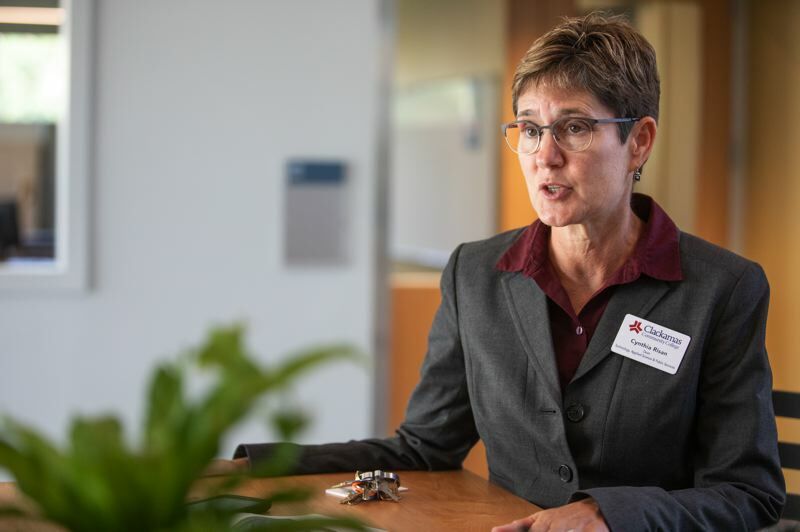 On a recent tour of the ITC, Cynthia Risan, the community college's dean of technology, health occupations and workforce, spoke about the bond and the public use of the $90 million raised. "When the bond passed in 2014, we had the opportunity to create a facility that reflects industry, and we wanted to make sure the shop floor reflects a shop floor that you would see in a local manufacturer," Risan told the Business Tribune. This it does, down to the brand name lathes and Computer Numerically Controlled machines arranged in chevrons, in the main lab. Mike Mattson, chair of the department of manufacturing, says the machines are never quiet for more than half an hour, such is the demand from students from dawn to 10 p.m. The center opened on Sept. 24, the first day of term, with no time to wait for a grand opening on Manufacturing Day, Oct. 5. "We've doubled our capacity for the second year of the program," Mattson told the Business Tribune. "Ninety-five-plus percent of the jobs are CNC now. The industry has changed a lot in the last five or 10 years." The college is bringing four of the seven manufacturing technology classes to the new building from Barlow Hall. The ITC has more machining space, 43,000 square feet up from 13,000 square feet. There are two computer labs, five classrooms, a flexible lab and a renewable energy learning space. 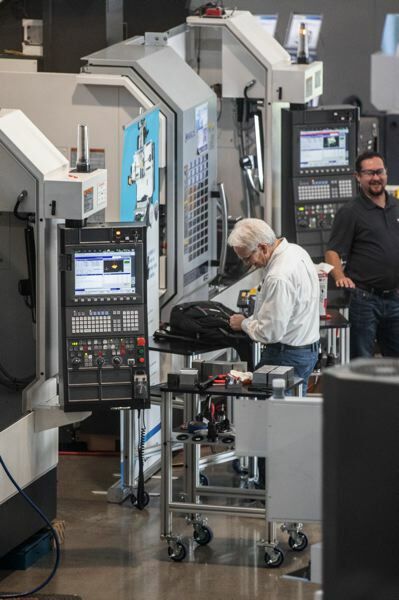 Half of the old machines were donated to high schools, and all of the modern CNC machines have been replaced with state-of-the-art ones, mostly on loan from manufacturers, who use the space as a training center/showroom. Walking into the main workshop, with its two-story high ceiling from which power cables and winches hang, the first thing one sees are manual lathes, known as engineer lathes, or metal-cutting lathes. They are old style in the sense that students must start on them so as to get a feel for cutting metal, but they are brand new, straight from Taiwan. They are branded Cadillac, but Mattson says the same factory probably puts different name plates on them, depending on where they are going. These lathes cost $12,000 each, compared to an entry-level CNC machine, which is more like $55,000. "But the CNC is at least 20 times as productive," he notes. On one manual lathe a student works on a class project making a "widget," a tapered shaft with a screw thread. 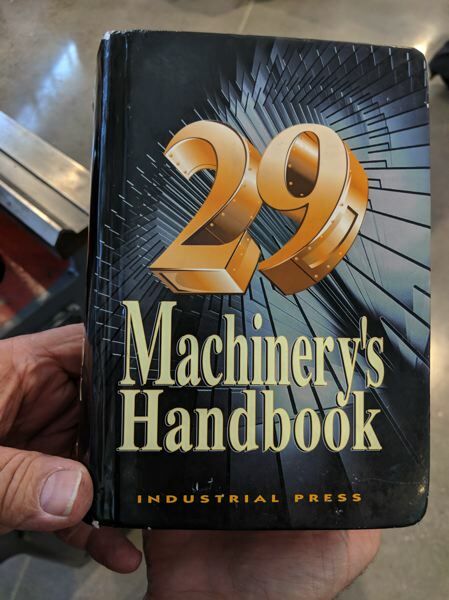 On a shelf they keep Machinery's Handbook edition 29, a fat book filled with numbers showing all of the tolerances relating to threads. Students learn about the torques that aircraft screws and bolts have to stand. They learn about threads per inch and pitch diameter, and all about inspecting their work. In another room there are thick granite tables on which students learn to measure. The room is kept at 20 degrees C because heat affects metal volume. Bob DelGatto, a machine tool tech instructor, measures a steel block, rubs it on the floor and measures again. Now it's off by several thousandths of an inch, thanks to the dust it picked up. "All the grit and chips being created out there (around the lathes), they have to overcome that to maintain this type of tolerance." Gathered around one CNC machine are several men who look to be in their 30s. "The average student age is 34," says Mattson. "They might be coming out of lesser jobs, construction, retail, the military. They didn't learn a trade out of high school or get into an apprenticeship. Maybe the opportunities weren't there. We see them back here after they've been kicking around for 15 years." So what aptitude does a 35-year-old need to thrive in this division? "You need good visual and spatial reasoning, to be able to take a drawing and turn it into a 3D model in your mind ... There's some personality traits too: being patient, and attention to detail is real important in machining. A hair or piece of dust is the difference between a good part and a wrecked part." They also need basic high school math. "We get people out of construction, they know how to use tools, work safely and read blueprints. If you find someone in their youth who worked on cars, bicycles or tractors, built a shed or houses, they can find their way into this industry. Construction and the military are two big ones." The Oregon Employment Department considers every program in the division as leading to high-wage, high-demand jobs. Someone in their second year can start as an entry-level machine operator at $18 to $21 an hour. As they progress up to being a programmer of CNCs, they can make around $35 an hour. After that they can matriculate into management, going to the Oregon Institute of Technology to turn their two-year degree into a four-year degree. Many are content to stop short of management. DelGatto says the seven-week summer internship with Boeing has been a hit, with the aircraft maker coming in once a year to recruit. "A student just got a job offer; there's potential for a good career there. They brought an employee in to see us, 25 years old, he's in the last year of doing the apprenticeship. He bought a house and a boat and really likes what he's doing." Other company with close ties are Machine Sciences, which subcontracts for Boeing, as well as Benchmade and Cascade Engineering. Mattson adds that a high schooler just graduated from their program three days before he graduated from high school. He's been snapped up by Nike for the company's mold division, under the Mia Hamm building, where they prototype molds for the solid parts of sneakers. "They have an elite team of seven or eight machinists and half of them came from here." It was a year of planning, talking to businesses, colleges and manufacturing consortiums, a year designing with the architect, Opsis, and a year of building, according to Risan. The architect had impressed the college with its work on schools in Gladstone and Canby. (The builder is Lease Crutcher Lewis.) The old Barlow space was elbow-to-elbow, and after class there was no place to stay in the building. 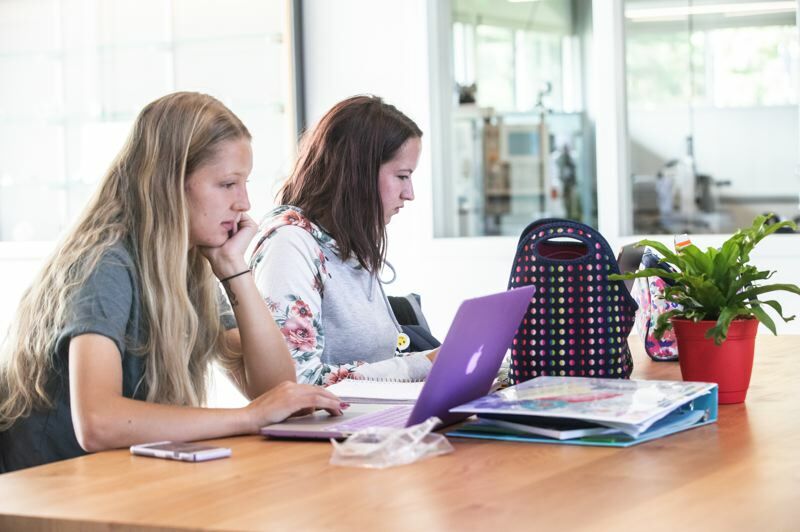 The ITC has all the requisite flex study space and hangout areas where students can work and be around their peers and faculty. There's a computer lab where students learn computer-aided drafting, right next to the CNC machines that will create the objects. But there are also general classrooms. On a recent Wednesday morning there were students taking English with no phones and no tools, they were squirmy and restless in that empty-handed way. Risan says they might look in on the workshop and think " 'Hey, what's going on in there?' And maybe they'll change their mind about manufacturing?" There's also a renewable energy learning space where Abe Fouhy, the renewable energy and alternative fuel instructor, teaches how to make a wind turbine from scratch, including setting the coils in epoxy, securing the magnets and hand carving the propellers from cedar. This might be the first time any of the students have done woodworking, given that it has been stripped from most high school programs. Outside is a gasifier, which turns biomass into liquid fuel, and a simulated roof for installing solar panels. At the far end of the large workshop are the high-end machines. 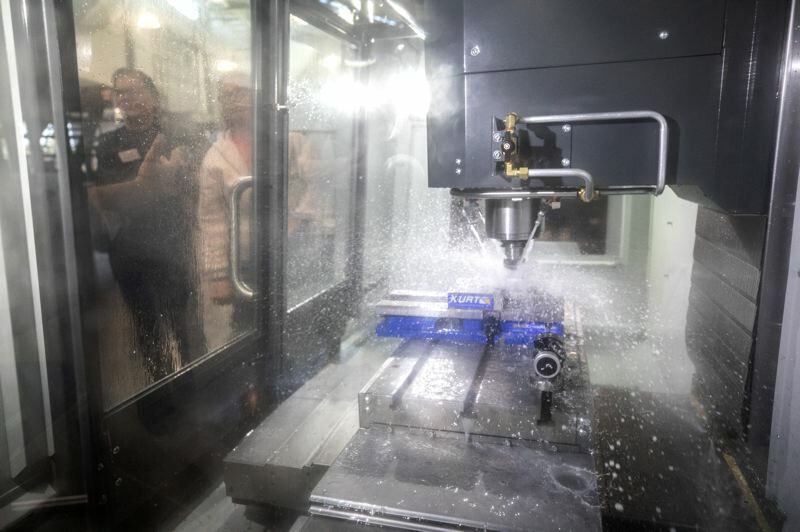 One is a $250,000 Okuma M460B 5AX, a five-axis milling machine. A similar one was lent by the maker Gosinger. Both firms want professionals people to train on their machines, and the rest of the time these CNCs are at a students's disposal for class. Sandvik provided around $6,000 worth of tools — the sharp carbide bits that cut through steel and aluminum like candy — as a piece of product placement for the opening ceremony. The Sandvik rep, Greg Pope, is upbeat. It's personal. "I studied here in the machining program over 20 years ago," he says, pointing out the old green lathe he learned on. "I worked in a shop and got the opportunity to get this education." 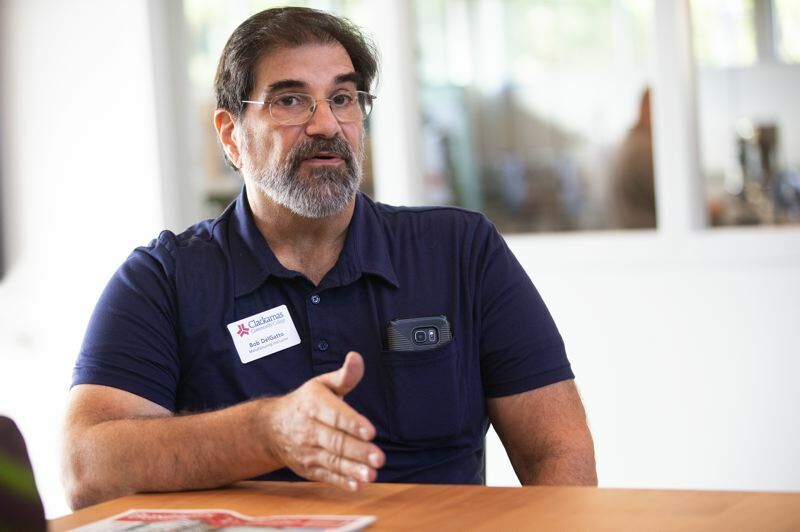 Bob DelGatto, the machine tool tech instructor, says the CCC web of contacts is growing. For example, he had his knees replaced with ones made by Orchid Orthopedics. The new joints are made from molded cobalt and chrome, in a process called investment casting. But after they come out of the mold, they are rough. Orchid used to send them back to the Midwest for machining. "A few years ago (Orchid) realized there was enough machine experience (in the area) and they opened a machine shop. A former CCC student is a machine shop manager," says DelGatto. "My ... knee replacements, they came from Orchid Orthopedics, and some of my students work there. There's a good chance they worked on my knees." Mattson outlines the bigger picture about how manufacturing should return to the U.S. from offshore. "What we're really seeing is a perfect storm. We had a generation who weren't interested in training people in the trades. The programs went away. Kids weren't interested, they were told the jobs were going overseas. Then the retiring of the baby boomers started and the replacement jobs are changing. 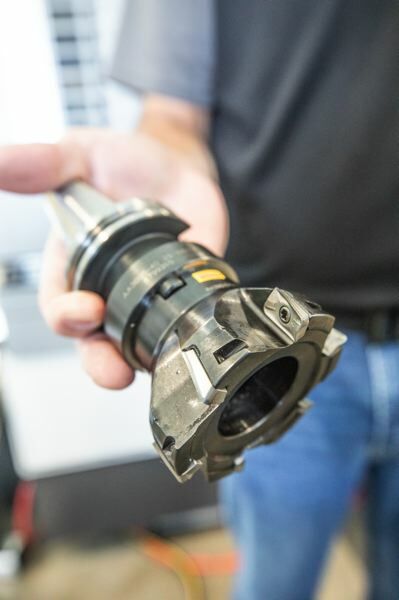 We've rapidly moved from manual machining to CNC machining." "People need good jobs. These types of jobs are very satisfying, allow people to have some pride in their lives. Also there are some economic and national security reasons. If we outsource all our jobs and we need that skillset, we've seen that in some of the big wars, we had to build the apparatus to protect ourselves," Mattson explains. "And it builds the middle class, having jobs that pay above average, $16 to $24 an hour. If we don't have the middle class, we don't have a good tax base and we see our schools and infrastructure crumbling."